Why Do We Charge For The ISPConfig 3 Manual? Will ISPConfig 3 Continue To be Free? What Does the ISPConfig 3 Manual Cost? 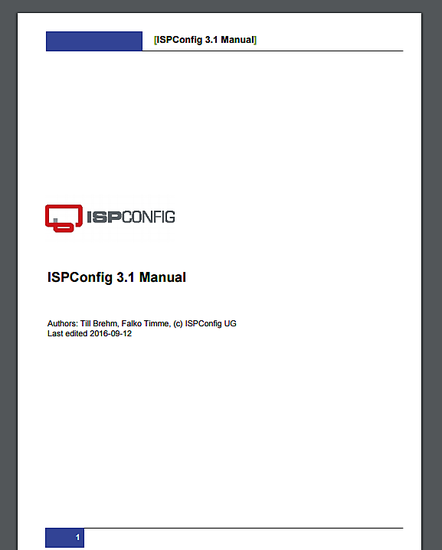 The good news first: the updated ISPConfig 3 Manual (version 1.4 for ISPConfig 3.0.5) is finally available (in PDF format). On more then 400 pages, it covers the concept behind ISPConfig (admin, resellers, clients), explains how to install and update ISPConfig 3.1, includes a reference for all forms and form fields in ISPConfig together with examples of valid inputs, and provides tutorials for the most common tasks in ISPConfig 3. It also lines out how to make your server more secure and comes with a troubleshooting section at the end. Now the bad news: we can't offer it for free. But it will be available for as low as 5 EUR per copy - we think this price is more than fair for a manual with more than 400 pages. We hope that this will allow us to employ an additional full-time ISPConfig developer who can disburden the core team. This would accelerate ISPConfig development a lot and also allow us to provide more support for ISPConfig users. You can download it either through an active HowtoForge subscription, or you can buy a single copy. Downloading through a HowtoForge subscription has the advantage that you get updates of the manual for free as long as you are a subscriber, while if you buy a single copy, no updates are included (i.e., you would have to pay again for new versions of the manual). A HowtoForge subscription costs 5 EUR for one month or 25 EUR for six months. If you want to download a single copy of the ISPConfig 3 manual, this costs you 5 EUR which is equal to buying a one-month HowtoForge subscription. The ISPConfig 3 manual is protected by copyright. No part of the manual may be reproduced, adapted, translated, or made available to a third party in any form by any process (electronic or otherwise) without the written specific consent of ISPConfig UG. You may keep backup copies of the manual in digital or printed form for your personal use. All rights reserved. This means it is not allowed to redistribute the ISPConfig 3 manual in any form (for example by offering it as a download on your web site). Your copy of the ISPConfig 3 manual will be personalized with your real name (or HowtoForge username) and email address. If you are an ISP and need multiple copies (e.g. for your clients), please contact us, and we will find a solution. 1.3 File Names, Protocol Names, System Specifications, Technical Specifications, User Names, Etc. 5.1 How Do I Create A Reseller? 5.2 How Do I Create A Client? 5.3 How Do I Create A Web Site? 5.4 How Do I Create An SSL Web Site? 5.4.1 How Do I Import An Existing SSL Certificate Into A Web Site That Was Created Later In ISPConfig? 5.5 How Do I Redirect My Web Site To Another Web Site Or To A Specific Directory On The Server? 5.6 How Do I Create An FTP Account So That I Can Upload Files To My Web Site? 5.7 How Can I Use Perl/CGI Scripts With My Web Site? 5.8 How Do I Create An Email Account? 5.9 How Do I Activate The Spamfilter/Virus Scanner For An Email Account? 5.10 How Do I Blacklist/Whitelist Email Addresses In The Spamfilter? 5.11 How Do I Fetch Emails From A Remote Server With ISPConfig And Put The Emails In A Local Email Account? 5.12 How Do I Create A DNS Zone? 5.13 How Do I Create A Secondary DNS Zone? 5.14 How Do I Create A Mirror? 5.15 How Do I Split Up Services Between Multiple Servers? 5.16 How Do I Unblock An IP Address That Got Blocked By fail2ban? 5.17 How Do I Create A Subdomain And Redirect It To A Different Folder/Web Site? 5.18 How Do I Manually Configure New IP Addresses On My System? 5.25 How Can I Access SquirrelMail From My Web Sites? 5.26 How Can I Access phpMyAdmin From My Web Sites? 5.27 How Can I Access Mailman From My Web Sites? 6.1 How Do I Disable Certain PHP Functions? 6.4 What Are Secure Settings For Web Sites Created Through ISPConfig? 6.5 How Do I Make fail2ban Monitor Additional Services? 7.1 How Do I Find Out What Is Wrong If ISPConfig Does Not Work? i want to create a server on centos 5.4 like mail server, proxy server, DHCP server etc. I am looking for the new ISPconfig manual for the just released 3.1. Thank you. You can download the new manual already on this page, the download links go to the 3.1 manual already. The page will get an update tomorrow to show the new manual details. 1) Do you still recommend adding that security script (that offers a type of intruder detection notification, and puts a first level at the httpd level of defense agains ddos attacks)? If so, why isn't it included in the install automatically? 2) You don't mention anything about LetsEncrypt - so I guess it works automatically? Why don't you mention a few words about this. I own the manual, but it's over 2 years old and will buy another copy, when I feel sure up-to-date info about lets encrypt is included. 3) There are numerous options for enabling TLS in the config files we modify that are not enabled, and you don't mention them. Any reason why? 1) What we recommend is described in the official installation instructions (perfect server guides) and in the ISPConfig manual. 2) Let's Encrypt is described in detail in the manual, e.g. the installation ins chapter 3.1.1 and in the chapters about client and reseller limits and it's usage in the chapter about website options. 3) TLS is enabled for SMTP, POP3, IMAP, FTP and ISPConfig automatically by the ISPConfig installer, so there are no further settings required. If you prefer to alter the defaults, then you may do that of course. - couldn't pay with PayPal as the PayPal script that you use keeps popping up an error message that my PayPal email address isn't valid (I tried on other browsers Edge, Chrome...same result :( ). - I paid with my credit card and downloaded the manual. That's really strange, the old manual is not available as download on our servers anymore, to be sure I just tested the above link and it returns the current ISPConfig 3.1 manual, same with the links on ispconfig.org. Please contact me by email to the address you received the invoice from so I can check the purchase and send you the current manual. And the PayPal address verification and login page is directly from Paypal, it's not from HowtoForge, so we have no influence on acceptance or rejection of an address. I guess I was able to find your purchase now and the email with the download link, I used your link and I got the ISPConfig 3.1 manual trough it. maybe you owned the old manual as well and mixed up an old copy with the newly downloaded? Please just download the manual again through the link you received from us, the link returns the current ISPConfig 3.1 manual. Thank you for the notice. The link has been fixed now.